The fabric is 100% cotton. 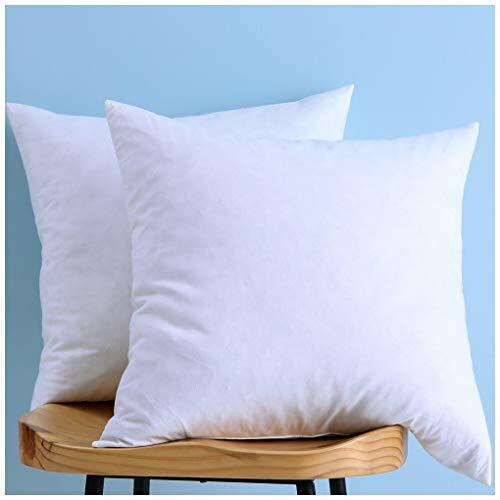 This Down and Feather Throw Pillow Insert is designed for a better firm support, the high quality material makes it exceptionally soft and comfortable. For use with all types of shams & covers, will look superb in any decorative pillow cover. Care Instruction-Machine wash, dry, and fluff. Price includes 2 pillow inserts, 18*18 inch. For use with all types of shams & covers, will look superb in any decorative pillow cover. These throw pillows are filled with feather and down. If you have any questions about this product by LunarTex, contact us by completing and submitting the form below. If you are looking for a specif part number, please include it with your message.